Improving immunization rates – what can the Law do? Many of us are concerned at the rise of cases of preventable diseases and the role played in that by the decision by a minority of parents not to vaccinate their children. One question is what, if any, effects would legal tool have on improving immunization rates? This article attempts to map out the available tools. Note that the focus of this article is what the law can do, not what the law should do. 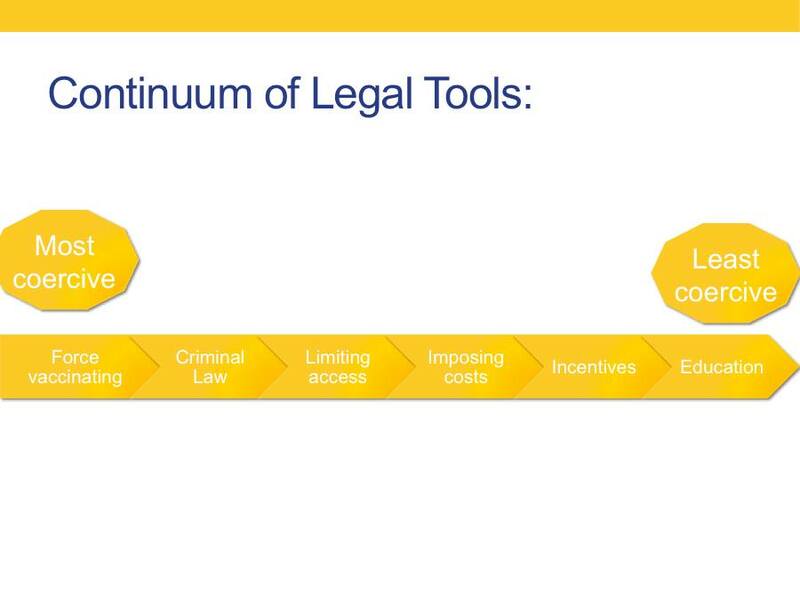 The fact that a legal tool is available – i.e. Constitutional, can be enacted or used by the courts – doesn’t automatically mean it should be. I would, in fact, argue that some of the tools discussed here shouldn’t be used in the context of immunization – in most circumstances, forced vaccination and criminal law are inappropriate. But mapping out what’s available seems like a useful first step in the discussion of what the law should do. The goal of this post is to provide a menu of options and a more or less logical way to classify them. My hope is that setting out what’s possible would help us think through what is desirable. The problem is clear. The scientific consensus is that for every individual, except those with medical contraindications, being vaccinated according to schedule is much safer than not being vaccinated. Maintaining high vaccination rates is also important for the public health: high vaccination rates protect everyone, because herd immunity prevents the disease from reaching those that are not immune, preventing outbreaks. In other contexts, for example, vaccinating health care workers protects vulnerable patients. Thus, society has several interests in requiring vaccination: (1) protecting individual children or adults who are vaccinated, (2) protecting, through herd immunity, those who cannot be vaccinated or for whom vaccinations have not been effective, (3) protecting particularly vulnerable subgroups like patients, and (4) protecting the whole of society against the risk of epidemic. In spite of that, some people are deterred from vaccinating themselves or their children, often because of anti-vaccine misinformation (though sometimes because of access problems). The question is what, if anything, can the law do to increase immunization rates? Is Jacobson (JACOBSON v. COM. OF MASSACHUSETTS, 197 U.S. 11 (1905)), the United States Supreme Court case in which the Court upheld the authority of states to enforce compulsory vaccination laws, still good law? Well, yes, in the sense that it has not yet been overturned and has been repeatedly cited by numerous state and federal decisions upholding immunization requirements. Would it be upheld if the question came directly before the Supreme Court? It’s a debate in the literature, though as best as I can see most scholars conclude that the core of the decision would be upheld. The best answer I can give is that the core holding in Jacobson would probably be upheld, though the court may elaborate on the conditions under which a state may require vaccination and set more clear limits. On one hand, a respectable jurisprudence has sprung up in the decades since Jacobson protecting patient autonomy. On the other hand, we still allow quarantining of individuals to protect the public against disease (pdf), other potentially coercive public health measures have been upheld, and the same point – preventing outbreaks of potentially fatal and certainly harmful diseases is a compelling public interest – holds. The situation is even clearer when it comes to children: vaccinating children affects not just the public health, but also the child. Since the risks of vaccinating, for any child except the few with contraindications, are much, much smaller than the risks of not vaccinating, the state may intervene to protect the child against a parent’s problematic decision not to vaccinate. There could also be a question of whether the First Amendment requires special accommodation, but the combination of our exemption jurisprudence and Hobby Lobby answers that with a pretty clear no. To reemphasize: this is a laundry list of what can be done, as a way to promote a discussion of what should be done. I therefore will do my best not to express an opinion on desirability (for example, I think forcibly vaccinating an adult is a horrible idea, overly coercive and overly paternalistic, and I can’t imagine a circumstance where that would be advisable; but I included the option). Forced vaccination: for an adult, this means holding an adult down and vaccinating them over their real opposition and resistance. This goes beyond Jacobson, so it may not, first of all, be constitutional, and to the best of my knowledge is not and has not been part of the law in the United States (Though historical narratives suggest it had been done in practice as late as the first half of the 20th century). There have, however, rarely been cases where courts ordered children vaccinated against the parents’ will, usually in the context of an outbreak. At a lesser level, but still close, an individual that refuses to vaccinate may be quarantined, there are such powers during an emergency (pdf). This is a little less coercive when it comes to children, but sometimes, a state can order children vaccinated against parental will. Criminal law: as in Jacobson, states could make non-vaccinating – or non-vaccinating in certain circumstances, such as during an outbreak – a crime, and attach a penalty. Not quite criminal, but still in the nature of sanctions, armed force members face sanctions if they refuse to vaccinate – for example, in the navy, “Service members who have not requested a waiver or whose waiver has been disapproved, and who refuse to take immunizations may be subject to administrative and disciplinary actions as deemed appropriate by COs, for violation of a lawful order” (pdf). Receiving permission for access to public pools, malls, or public transit. Gaining access to certain jobs, teachers, restaurant workers, for example. Fault options: tort suits can be brought – with or without legislative support – for failure to vaccinate that harms a third party, or against her parents, by a child left unvaccinated. No fault: 1) Nuisance suits can be brought against non-vaccinating individuals if their actions lead to outbreaks, or 2) Fees, taxes or other costs can be legislatively imposed on the non-vaccinating. Monetary subsidies or incentives: We already use some of these to handle access costs. For example, the Affordable Care Act requires insurance companies to cover the costs of vaccinating. The Vaccines for Children Program provides vaccines to children who would not otherwise be able to pay. Additional options include tax breaks for those who vaccinate, or acknowledging vaccines as a wellness program under the Affordable Care Act and providing premium breaks to those who vaccinate. Or offering subsidies for vaccines not covered by insurance. Other incentives – transparency: in the extreme case, you could publish the names of unvaccinated children in a school or facility. Less stigmatizing, you could provide – as California does, for example – rates of immunization in schools, preschools and daycares. Education: most immunization-related educational efforts have nothing to do with legal tools, and a lot of work is done in this sphere by non-profits or government organizations. The focus here is only on whether the law can have a role in immunization-related education. One way is for states to require a relevant module in the primary or secondary school curriculum, teaching children about vaccines and their importance. Adding an educational module before allowing exemptions from school immunization requirements is another tool that has now been put into use in several states. Hopefully, this list can help spur a discussion about what should be done. Note: please vote in the poll associated with this article.